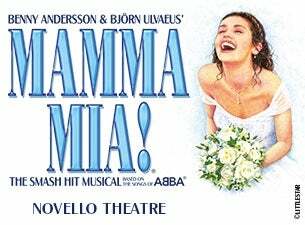 Novello Theatre - LondonMamma Mia! Join the ultimate feel-good party as MAMMA MIA! celebrates 17 years as the world's sunniest and most exhilarating smash-hit musical! Since premiering in London, this irresistible, sunny, funny comedy has thrilled over 60 million people all around the world and there's never been a better time to see this unforgettable musical in the West End, where it all began. Whatever age you are you can't help but have the time of your life at MAMMA MIA!